Aspiring to climb better I’ve decided to increase the strength in my fingers using a hang-board… well a home-made 20mm ledge as budget allows (will get a real one if it ever looks like I could get to 3 or 2 finger pockets!). Based on the performance climbing workshop I did with Lee Cossey and Andrea Ha last year (highly recommended) hand strength is where I can make some gains. But I need help as I can barely hang for 2 seconds on my ledge. So I’ve rigged up a counterweight in my workshop and hang every now and then between jobs. This rig is variable-weight taking advantage of the load multiplication effect — the thing about angle of a sling between a two point anchor. I’ve used Richard Delayney’s Highline Tension Calculator to come up with these figures, check it out on RopeLab (you have to be a member to see this content, only $60 per year — lots of other good stuff there). I’ve rigged a line from one truss to a pulley on the truss where my ledge is, then down to a foot loop or dowel to stand on. In the middle of the horizontal span I use another pulley to hang a bit of railway track, about 10kg (could do without this without a pulley and just tie the weight to the middle). You have to muck around with the lengths of each bit to get it set up right. So we know that the wider the angle the more force is put on both anchor points. In this case as I pull up the weight and stand on a dowel at the end of the line, then hang and lift my feet off, the assistance I get is 17kg. I can decrease the assistance weight by bending my knees — it comes down to 8kg. The angle in the first instance is 140º and goes down to about 102º. 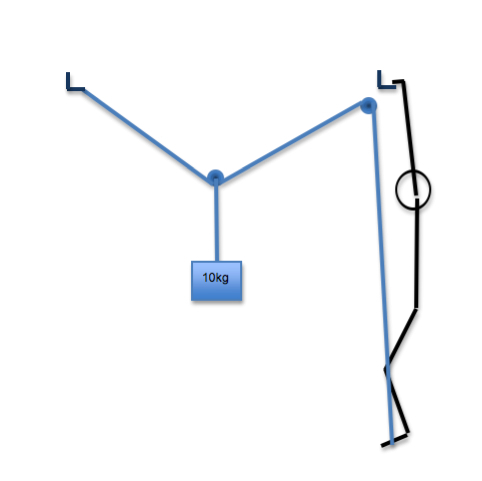 The span (between anchor and pulley) in this set up is 2m and the sag (where the weight pulls down) is 0.3m to start with and 0.8m with knees bent. The good thing about this rig is that you don’t need your harness on, just pull down and step on. Handy for sneaking in a hang when I should be working. You can really feel the load multiplication effect in this rig as the assist weigh changes dramatically the higher it gets.